The IIHS is the group that brings you the Top Safety Pick+ rating. Now they have a new ratings system that rates how well cars can avoid a forward crash. You will be shocked which company has the best system. It's not Volvo. The Insurance Institute for Highways Safety (IIHS) has developed a new ratings system which will inform buyers about which cars have the best forward collision prevention systems. The new testing by IIHS will provide a rating that consumers can easily understand when they shop and augment the current “Top Safety Pick+” that many buyers already know and understand. Going forward, in order to receive the Top Safety Pick+ rating a vehicle will at least have to have some basic forward collision prevention systems. Although Volvo made headlines first with its advanced system called Collision Warning with Full Auto Brake and Pedestrian Detection, the system is not in many cars yet. In order to determine if it is working, the IIHS’ sister organization, the Highway Data Loss Institute (HDLI) conducted a statistical study of vehicles with the Volvo City Safe system, which works at low speeds. The results prove that the systems do work as Matthew Moore, HLDI vice president and director of the study explained, saying "Consistent with prior results, this study shows that forward collision systems are working. That is good news because an increasing number of vehicles have these features. These features are preventing common, everyday crashes caused by inattentive drivers or drivers who don't react quickly enough to emergency situations." 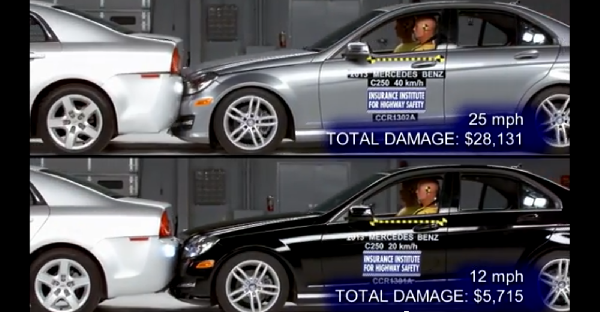 There are three levels of forward collision prevention that the IIHS recognizes. The top level is Superior. To achieve this level of rating the vehicle must be able to both alert the driver of an impending collision at speeds of 12 and 25 MPH, and also take action to brake the car. Of the cars that achieved this score the IIHS like Subaru’s system best. Called EyeSight, it was able to help cars avoid collisions at both speeds. Cadillac’s system also did well. The next level down is called Advanced. To achieve this level of rating a vehicle must have both a warning system and also some form of auto-braking that reduces the vehicle’s speeds to lessen or help prevent an accident. The lowest level of rating is called Basic. At this level the vehicle meets NHTSA’s basic requirements and can alert the driver in some low speed scenarios. IIHS conducts five runs with test vehicles towards and inflatable obstruction. This is done at both 12 and also 25 MPH. Vehicles with any form of system that meets the basic NHTSA requirements get one point. Vehicles are then awarded more points, up to 6 depending upon how they perform in the testing. A score of 2 to 4 results in the Advanced rating and a score of 5 or 6 results in a score of Superior. The Institute has begun testing of current model year, 2013 and 2014 vehicles in the moderate price ranges upwards. Due to the new testing buyers can expect a wave of new safety marketing announcements from vehicle makers. For information on how the tested cars have performed please visit IIHS’ summary link here.